giving a much more stable pH reading. 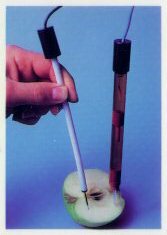 pH mono probe with an immersion depth of 0.1 mm. *Broad pH range. 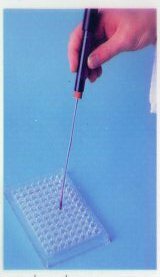 The pH range of the Ultra M comb pH probe is 1 to 12.
measurements is also available. See ordering information. *Measure common ions in 1/10 of a drop of liquid. state sensors, making them virtually unbreakable. making them much faster than liquid membrane electrodes. measure down to 0.02 ppm. Electrode Conc. Range(ppm)	Interferences	Size		Cat. No. electrodes which are not combination electrodes.